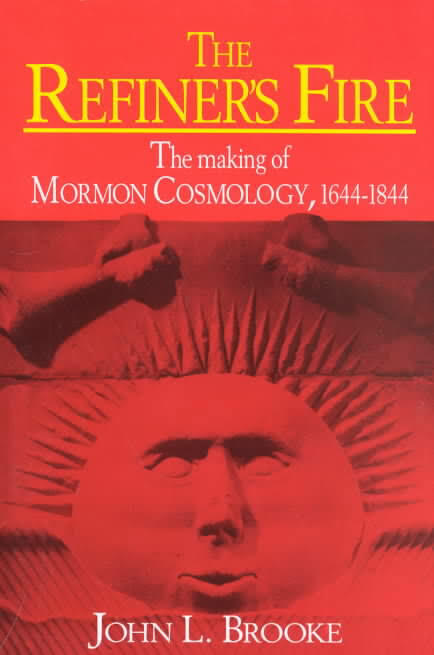 John L. Brooke, The Refiner's Fire: The Making of Mormon Cosmology, 1644-1844 (Cambridge: Cambridge University Press, 1996). It can be argued that the religious context of the birth of Mormonism is substantially located within the framework of four primary influences: Jewish kabbalism, folk magic, Anabaptist biblicism/millennialism, and "hermeticism." While authors such as Lance Owens, D. Michael Quinn, Philip Barlow and Jan Shipps, among others, have illuminated especially the first three of these influences, the factor of "hermeticism" is the special focus of this important contribution by John Brooke. (Note: The term "hermetic" describes any religion which offers access to the "sealed mysteries" of the universe through esoteric knowledge and/or rituals, thereby offering the recovery of the divine powers of Adam which were lost in the Fall.) Brooke is the Arthur Jr. and Lenore Stern Professor of American History at Tufts University in Medford, Massachusetts. and the philosophical traditions of alchemy and hermeticism." The central thesis of the work is clearly stated in the preface: "Quite simply, there are striking parallels between the Mormon concepts of the coequality of matter and spirit, of the covenant of celestial marriage, and of an ultimate goal of human godhood and the philosophical traditions of alchemy and hermeticism, drawn from the ancient world and fused with Christianity in the Italian Renaissance" (p. xiii). The central thesis which occupies this study is intended by Brooke to stand in contrast, not so much with traditional LDS scholarship — although it does do that in some significant ways — but with those historians who would seek to identify Mormonism as the "quintessential American religion": "Rather than running from the Puritanism brought to New England in the Great Migration, firmly situated in the Magisterial Reformation of Calvinist theology and a state-supported religion, Mormonism springs from the sectarian tradition of the Radical Reformation, in fact from its most extreme fringe" (p. xv). Brooke acknowledges his dependence upon a stream of scholarship which has emphasized the influences of hermetic thought upon European Renaissance and Reformation culture: "Smith’s Mormon cosmology is best understood when situated on an intellectual and theological conjuncture that reaches back not simply to a disorderly antebellum democracy or even to early New England but to the extreme perfectionism forged in the Radical Reformation from the fusion of Christianity with the ancient occult hermetic philosophy" (p. xvi). Brooke combines the insights of this stream of scholarship with the influential research of D. Michael Quinn concerning the centrality of the "magic world view" in the quest for Mormon origins (see xvii). Brooke’s thesis is certainly provocative, for as we shall see, it provides an alternative explanation for many of the key aspects of Mormon theology and ritual which some LDS apologists attempt to root in the ancient world. The work is divided up among three main sections. The first part is comprised of three chapters that fall under the heading "A Prepared People." In these chapters Brooke attempts to provide a broad context for his overall thesis; that context being the European Radical Reformation and its religious antecedents. In the first chapter (pp. 3-29) he traces the roots of hermetic philosophy prior to the Reformation period into the Middle Ages. Brooke notes: "The origins of hermetic thought lay in Greco-Roman Egypt, where ancient metallurgical traditions were fused with Platonism, Gnosticism, and Egyptian theology. Passing from Islamic sources at the turn of the twelfth century, fragments of the hermetic philosophy emerged in medieval Europe in the form of alchemy" (p. 8). The Radical Reformation, Brooke argues, was more open to such religious influences than the theologians of the Magisterial Reformation who attempted to maintain the status quo: "Just as the purification of the church by Protestants and Catholics isolated and demonized the cunning folk, so too the hermetic magus was expelled in the destruction of the medieval synthesis. When recombined in the Radical Reformation and the English Revolution with currents of millenarian prophecy and a conviction of the imminence of the restored Kingdom of God, hermetic divinization posed a potent challenge to Christian orthodoxy" (pp. 7-8). Brooke places the theological antecedents of Mormonism within this struggle between the established religion of Calvinistic orthodoxy and the perfectionist/hermetic tendencies of the Radical Reformers: "Three centuries after the height of the Renaissance, Mormonism echoed the hermetics — and explicitly rejected Calvinism — in its advocacy of universal salvation and the freedom of the will, its replacement of the doctrine of original sin with that of the fortunate Fall, and its denial of the efficacy of grace alone" (p. 13). Brooke further adds: "In granting priestly powers 'to seal up the Saints unto Eternal life,' Joseph Smith gave the Mormon hierarchy the same authority that the hermetic alchemist assumed: human means to immortality, indeed divinity" (p. 13). In Brooke’s second chapter (pp. 30-58) he attempts to document the influences of the Radical Reformation in early America, which paved the way for those peoples in the northern colonies who were first presented with the message of the new Mormon religion. He insists that the biblical primitivism of Puritan culture does not provide sufficient theological antecedents to the hermetic synthesis of the Mormon religion: "Hermetic perfectionism, Adamic restoration, and popular magic arrived in full form not with the Puritan migration to New England but with the migration of the survivors of the Radical Reformation to the Mid-Atlantic" (p. 38). In chapter three (pp. 59-88) he documents more specifically possible influences along these lines among the families of the earliest Mormon converts. Part II also consists of three chapters, which revolve around the theme of "Hermetic Purity and Hermetic Danger." The catchwords which embody these two poles are "Freemasonry" on the one hand, and "counterfeiting" on the other. The rise of Freemasonry in early America is the subject of Brooke’s fourth chapter (pp. 91-104). "The late-eighteenth-century revival of the hermetic occult and its diffusion to America intersected with the rise of intense millenarian aspirations, and these framed a powerful affinity between Masonic mythology and Christian perfectionism" (pp. 103-04). Chapter five (pp. 105-28) focuses on the opposite pole ?that of "hermetic danger." Between the two poles of revitalized hermeticism and Freemasonry on the one side, and counterfeiting and false secret societies on the other, lay the ambiguous middle ground of "divining" for treasure: "These hermetic dangers all involved money in all its various forms and all its shades of legitimacy, and the deceptions that people practiced in the name of money. The connections between money and hermeticism, legitimate and spurious, already had a long and tangled history by 1830, and they would play a powerful role in the story of Mormon emergence" (p. 105). In Brooke’s sixth chapter (pp. 129-46) he argues that the interplay between hermetic purity and hermetic danger had a formative role in shaping the attitude toward traditional religion among Joseph Smith’s family: "Long before the 1820s the Smiths were caught up in the dialectic of spiritual mystery and secular fraud framed in the hostile symbiosis of divining and counterfeiting and in the diffusion of Masonic culture in an era of sectarian fervor and profound millenarian expectation" (p. 129). Having set his thesis within a broad and rigorous historical context, Brooke moves on in part III to the heart of the matter, "The Mormon Dispensation." In chapter seven (pp. 149-83) the author describes the coming forth of the Book of Mormon, and locates its origin within the historical context of Joseph Smith’s preoccupation with hermetic purity and danger. In part, Brooke’s discussion is intended as a criticism of Fawn Brodie (p. 180), who emphasized the independent role of Joseph Smith’s imagination in the creation of the storyline for the Book of Mormon. Brooke in a sense agrees with those critics of Brodie who insist that Smith’s imagination alone could not have produced the Book of Mormon. However, Brooke also disagrees with those LDS apologists who would argue that divine inspiration is the best explanation. Instead, he argues that Smith’s predisposition towards hermeticism provides a more plausible origin for many of the unique features of the Book of Mormon than the hypothesis of divine intervention. Chapter eight focuses on the years 1830-33 (pp. 184-208), when, Brooke proposes, that Joseph Smith, under the influence of Sidney Rigdon, began to overlay the biblical primitivism of the Book of Mormon with an implicitly hermetic theology: "Smith’s theology went far beyond the universalism of the revolutionary sects to announce an invisible world structured by three heavens, the potential for divinity, the pre-Creation existence of eternal spirits, and their material nature. Much of this doctrine must be ascribed to a personal predisposition toward a hermetic interpretation of the 'mysteries' " (p. 205). Among other influences during this period, Brooke identifies the "cosmic system" of Emmanuel Swedenborg as providing much of the conceptual structure of Smith’s theology: "Swedenborgian theology, shaped by Paracelsus and Jacob Boehme, provided one direct connection to the high hermetic tradition, and its system of a triad of heavens reflected a wide range of occult influences. Swedenborg’s cosmos was summarized in various short texts available at Palmyra, and translations of his original texts would not have been too difficult to locate in the 1830s" (p. 205). Chapter nine focuses on the years 1833-39, as, Brooke proposes, Smith’s theology moved from implicit to explicit hermeticism (pp. 209-34). Brooke identifies the building of the Kirtland temple (1833-36) as a watershed event in this evolution of Mormon theology: "Where the original Mormonism of the Book of Mormon combined old with new, the Mormonism of the Kirtland temple was a fundamentally different religious tradition. This new religious tradition had been articulated in language, but with the temple dedication it was articulated in social and theological process. It brought into focus the Mormon departure from simple biblical primitivism" (p. 221). Brooke places the controversies over charges and counter-charges of heresy, counterfeiting and sexual immorality within the Mormon community, which led to the excommunication of Oliver Cowdery, Martin Harris and David Whitmer (among others) in 1838, within this broader context of theological development. In chapter ten, Brooke focuses more specifically on the development of Joseph Smith’s hermetic theology after the move to Nauvoo, Illinois in 1839 (pp. 235-61). "Given form by the ritualism of a revitalized American Freemasonry, and with nostalgic references back to the cult of treasure divining, the new Mormonism of Nauvoo was a powerful rearticulation of a literal restitutionism and a hermetic perfectionism deriving from the late Renaissance, the Radical Reformation, and the English revolutionary sects" (p. 236). It was during this period that three central rituals were introduced: baptisms for the dead (1840), the sealing of eternal marriages (1843) and the temple endowment (1842). Antecedent parallels for proxy baptism and celestial marriage are identified by Brooke in the Zionitic Brotherhood (p. 243), and Swedenborgianism (p. 257), while the temple endowment is connected with Masonic symbolism (pp. 244-53). This would indicate once again, that one need not look to the ancient world for parallels to many of the unique features of LDS theology. They can just as easily be explained on the basis of contact with more contemporary influences. Brooke identifies the themes which Joseph Smith spoke of in his famous King Follett sermon in April 1844 as the climax of the previous fourteen years of Mormon doctrinal development: "This sermon, delivered twice to crowds of thousands gathered on successive days at the Nauvoo grove, is a critical benchmark in Mormon theology. What had been obscure and ill-defined was now part of the public record" (p. 254). The final two chapters cover the period from Joseph Smith’s murder in 1844 to the present time. Chapter eleven (pp. 262-77) discusses the period up to the 1850s, as the Mormons pulled up stakes and moved to the Great Basin of Utah. He discusses, among other things, Brigham Young’s view of the divinity of Adam, and the theological tensions between Young and Orson Pratt, who demurred from what he believed to be a naively anthropomorphic view of the Deity: "In some measure, Young’s assault on Pratt derived from his own very different interpretation of the hermetic inheritance. Pratt’s diffuse, absolute, and perfect divinity permeated matter, whereas Brigham Young’s divinity was finite, grounded in a specific fusion of spirit and matter" (p. 276). In chapter twelve (pp. 278-305) Brooke brings the discussion up to the present time, and argues that after the move to Utah, the Mormon church has increasingly retreated from her hermetic origins: "As early as the 1850s the Mormon church began a long and slow retreat from a pinnacle of Kingdom autonomy and hermetic culture toward an accommodation with, if not an acceptance of, American culture. A new 'steady state' would not emerge until after the Manifestos setting aside polygamy in 1890 and disassociating the church from politics in 1891" (p. 281). Brooke goes on to observe: "In this transformation, the hermetic fabric of Mormon theology was redisguised and partially abandoned, to the point that modern Mormon theology may well soon become essentially indistinguishable from conservative Christian fundamentalism" (pp. 281-82). This theological transformation occupies the bulk of Brooke’s discussion in this final chapter. He cites as evidence, the LDS church’s repudiation of the divinity of Adam (p. 291), her renewed emphasis upon the importance of Christ’s atonement following the writing of John Taylor’s An Examination in and an Elucidation of the Great Principle of the Mediation and Atonement of Our Lord and Savior Jesus Christ (pp. 289-90), recent changes made to the temple endowment ritual (p. 295), and the advent of a "neo-orthodox" camp within the Mormon church which has called for a renewed emphasis upon salvation by grace (pp. 296-97). In conclusion Brooke wonders: "Given a century of 're-Christianization,' the salience of traditional Mormon doctrines among ordinary Mormons, relative to a generalized Christ-centered salvation, is not altogether clear. Since the turn of the century the church itself has been de-emphasizing the distinct doctrines of the church; since 1950 references to Joseph Smith have declined just as fast as references to Jesus Christ have grown" (pp. 304-05). However, Brooke does not believe this is a positive trend; rather he believes it would be better if, "Mormonism would return to its origins as a 'new religious tradition,' a tradition forged in nineteenth-century America from ancient elements" (p. 304). My own thoughts on Brooke’s contribution will have to be brief. This is probably one of the most significant books ever written on the subject of Mormon origins. His research is extremely thorough in most regards, and I find his overall case for the influence of hermeticism upon early Mormon thought to be compelling. Some LDS reviewers have complained that Brooke frequently overlooks biblical sources for distinctive Mormon beliefs, leading him to stretch the evidence in search of hermetic parallels. However, the fact that biblical texts were employed in the construction of LDS doctrine — something which Brooke himself often acknowledges — does not answer the question as to why particular texts were developed in the distinctive manner in which Joseph Smith chose to do. In particular, the LDS doctrines of proxy baptism, celestial marriage, the pre-existence of spirits, eternal progression, the Melchizekek priesthood, the temple endowment and the materiality of spirit cry out for some sort of explanation beyond the direct influence of the Bible. This is not to say that The Refiner's Fire is a perfect book. At times the alleged influence of hermetic thought does indeed appear forced; this is especially the case, in my opinion, in Brooke’s discussion of the Book of Mormon in chapter seven. But my most fundamental criticism lies in his view that the tendency of LDS leadership to move away from the church’s hermetic origins, and closer to Christian orthodoxy, is a bad decision. Brooke believes that it is precisely in its hermetic origins that Mormonism has the potential to make the most significant religious contribution, by "building on its optimistic, spiritual, and equalitarian implications" (p. 304). But in my view, it is precisely along this path that there lies the potential for continued doctrinal reform within the Mormon church. The closer Mormonism gets to its pre-Nauvoo origins, rooted in Christian primitivism and the message of the Book of Mormon itself, the closer the LDS church comes to a potential recovery of a truly Christian theological framework. Evangelical Christians should pray that the living Spirit of God would move in a sovereign way upon the hearts of the LDS people to abandon hermetic religion, to step even further into the light, to breathe more the fresh air of Truth, and to drink ever deeper in the clear, cool streams of orthodox Christian doctrine.